Although it’s mid-May, there’s still enough of a chill in the air to turn on the oven without making the kitchen uncomfortably hot. Knowing there would be few opportunities left to make a roast, at least until next Fall, I had my little brother, Stephen the Butcher, bone out a beautiful picnic shoulder of pork. I fantasized about smothering the pork in herbs, drooling before I even brought it home to actually season it. Picnic shoulder comes from the lower part of the pig’s shoulder. 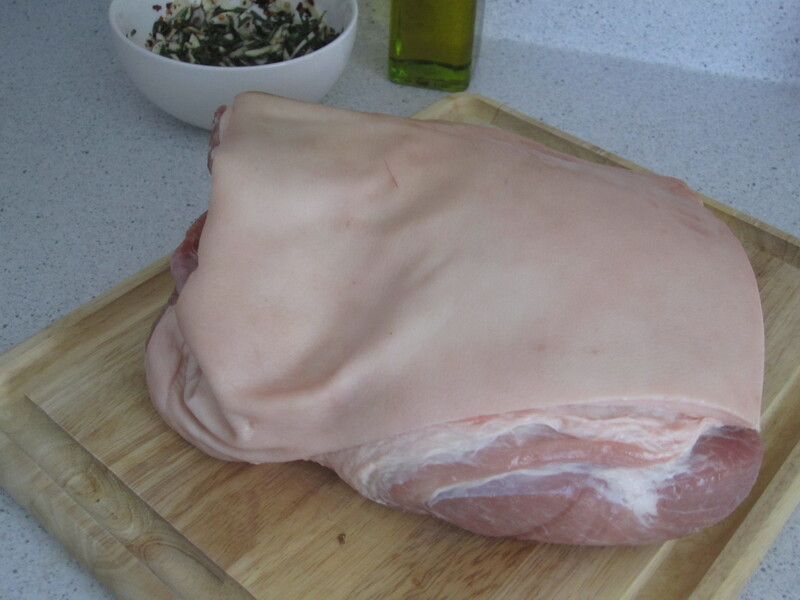 It can be a fatty piece of pork, so be sure to have it trimmed. 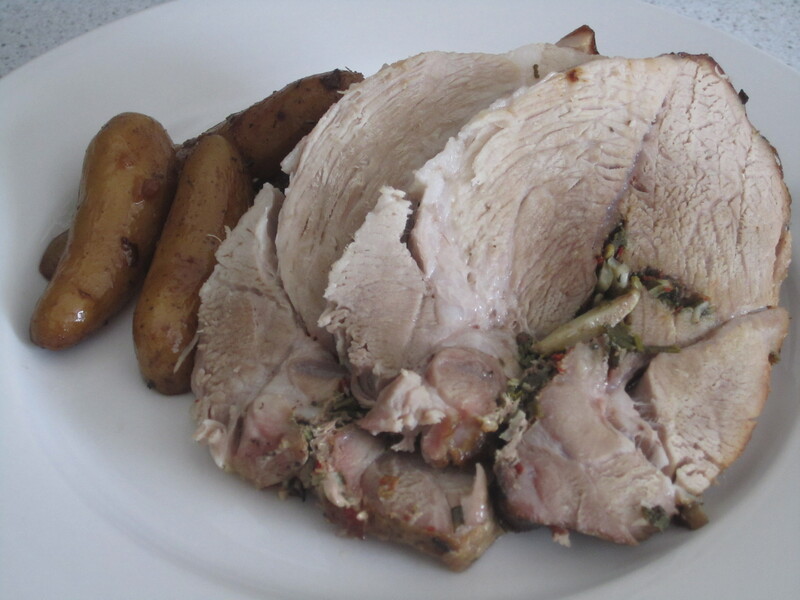 Picnic shoulder is an inexpensive cut of meat and is extremely versatile. It can be barbecued, braised, roasted, used in stews or kabobs. This is the cut most commonly used for one of my favorite dishes, barbecued pulled pork. 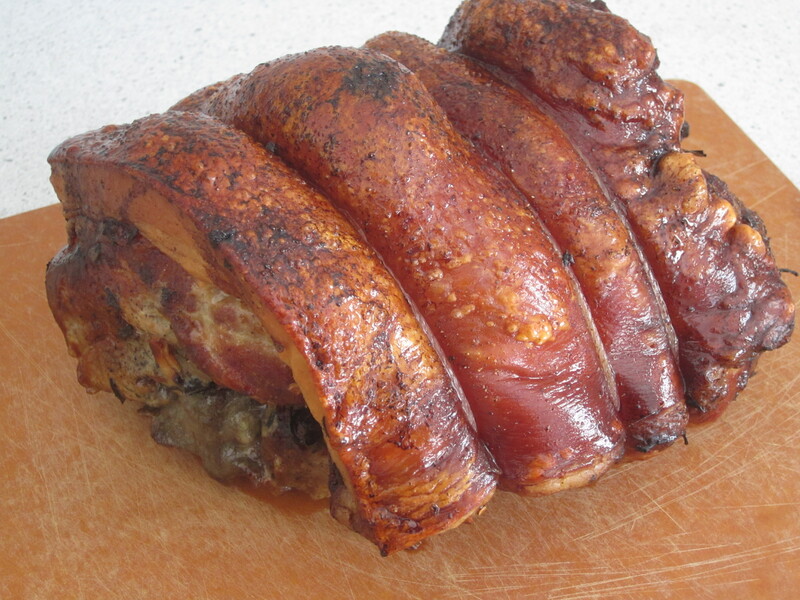 Picnic shoulder is also used to make smoked hams and ground pork. In many Spanish-speaking countries, especially those in the Caribbean, picnic shoulder is extremely popular during the holidays and special occasions, used to make pernil, a slow-cooked roast richly seasoned with salt, pepper, cumin, oregano, a splash of bitter orange, and lots of garlic. When I first thought about bringing home a picnic shoulder, I immediately thought about making pernil. I could almost taste the succulent pork, which would have tasted even better dipped in mojo. I quickly dismissed that idea, deciding to think outside the box, using some flavors I had never tried before with pork. I came across a recipe for an easier, American-ized version of porchetta, and decided that rosemary and sage were the way to go. It proved to be a fantastic decision. Roasting the pork shoulder on a bed of fingerlings results in tender, flavorful potatoes that require almost no work! If you’re uncomfortable boning out a pork shoulder, or any cut of meat for that matter, just ask your butcher. They’ll be more than happy to help! Prepare to get your hands dirty! You’ll want to rub the seasoning into every nook and cranny of the pork! 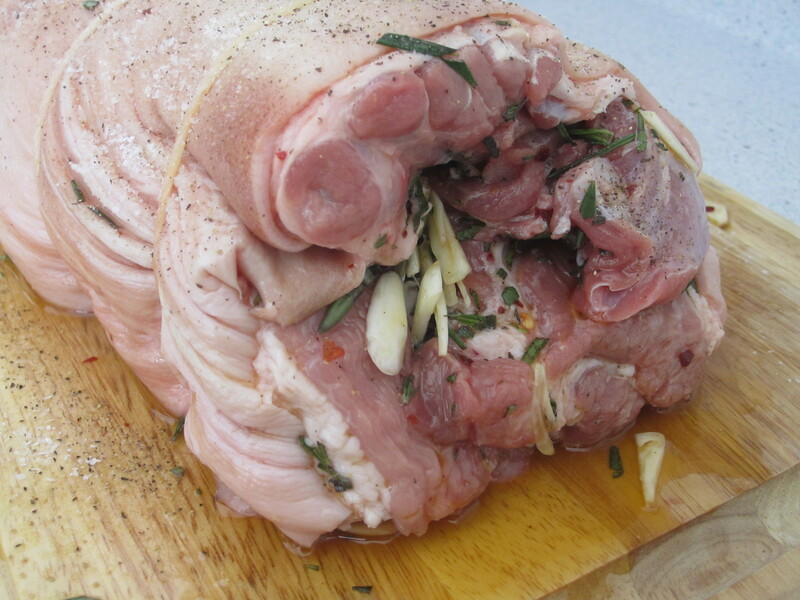 Stuffed with goodness, this pork smells delicious before it even goes in the oven! Don’t be afraid of roasting this baby at high heat. Keeping the skin on protects the rest of the meat, leaving it juicy and flavorful. The added bonus is the pork crackling, a delicious treat! Preheat the oven to 450 degrees. Combine the rosemary, sage, garlic and crushed red pepper in a small bowl. Mix with enough olive oil until a paste has formed. 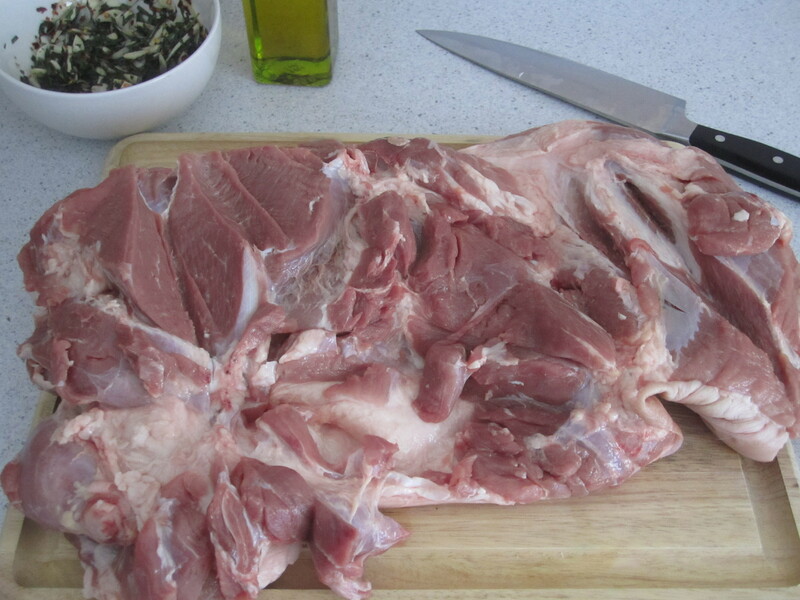 Cut the sides of the pork so it opens and lies flat on your cutting board. Rub the paste all over the inside of the pork shoulder, then sprinkle generously with salt and pepper. Roll the pork and tie tightly with butcher’s twine. Place the potatoes at the bottom of a large roasting pan. Season with salt, then toss in the bundle of thyme. Rest the pork roast on top of the bed of fingerling potatoes, making sure the pork skin faces up. Rub the top of the pork with a bit of oil and put in the oven. Roast for about 30 minutes. By this time, the skin should start to become a gorgeous brown color. Don’t be afraid of browned pork skin – it’s tasty! Add the wine and chicken stock to the roasting pan. Roast for another 2 to 2 ½ hours, basting the skin occasionally with the pan juices. Tent the roast with aluminum foil if you feel the skin is becoming too dark, but be sure to remove the foil during the last half hour of cooking. Once the roast is done, remove from the pan, cut the string, and let the pork rest for about 15 to 20 minutes. Remove the skin and cut into large squares. Slice the pork and arrange on a platter with the fingerling potatoes, making sure to spoon lots of the the pan juices on top. Garnish with pork crackling and serve. Prepare to chow down!